Ridership on the nation's buses and trains has its one of its biggest quarterly jumps ever, as high gas prices and a rebounding economy entice commuters to mass transit. NEW YORK (CNNMoney) -- Mass transit use jumped 5% in the first quarter of 2012, as high gas prices and a rebounding economy put more people on the bus and train. Over 2.65 billion trips were made using trains, buses, ferries or street cars in the first quarter of 2012, according to the American Public Transportation Association. That's up from 2.5 billion trips in the same period last year. The increase was one of the largest quarterly jumps on record, and comes on the heels of a 2011 ridership rate that was the second highest since 1957 -- when widespread use of the car and suburbanization began to turn many people away from mass transit. Of course, high gasoline prices were a defining theme at the start of 2012. Gas rose to nearly $4 a gallon -- its highest level ever for that time of year -- as an expanding economy and fears over Iran drove up the price of oil. Now it's a different story. Gas prices are down to $3.61 a gallon, and will likely head lower in the coming weeks. Crude prices hit a 7-month low last week as the mess in Europe continued to spiral. 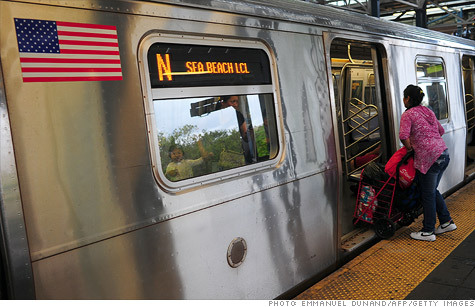 So the question for mass transit is: Will people still ride as gas prices fall? Yes, says APTA President Michael Melaniphy. "Once people try transit, they tend to stay," says Melaniphy, noting ridership rates didn't fall nearly as much as gas prices did following the financial crisis of 2008. People like the ability to read a book, check e-mail or just take a nap, he says, while cleaner stations and vehicles and more predictable schedules help entice commutes back to public transit. Still, even with the large jump, America remains a nation of drivers. Just 5% of the population commutes using public transport, according to the Census Department.